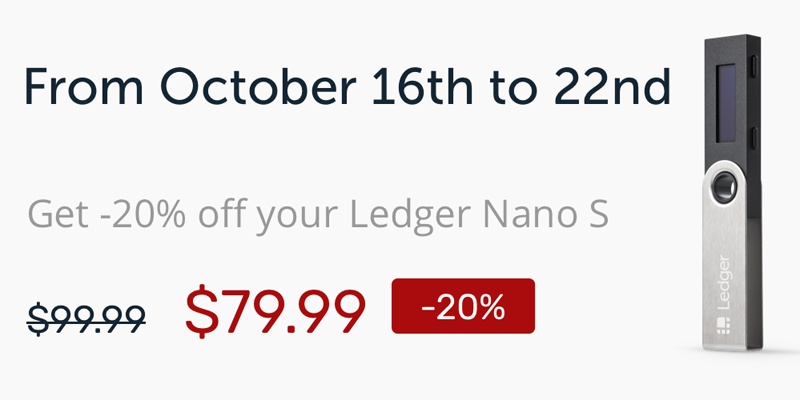 Our favorite and arguably the world’s most popular hardware wallet, the Ledger Nano S, is on sale right now! They are currently offering customers 20% off, making the wallet just $79.99! This sale is only running from October 16th to the 22nd, so get in quick if you are in the market for a hardware wallet. You do not need a promo code for this deal, just head over to their store and get your wallet for 20% off! The wallet supports over seven hundred cryptocurrencies, including Bitcoin, Ethereum, Ripple and Monero. If you want to know more about the Ledger wallet, check out our review of the Ledger Nano S.
Want to know more about hardware wallets and compare the Ledger Nano S to other wallet types? Visit our cryptocurrency wallet comparison table for all the answers you are looking for!